Written by webb valarezo on Thursday, October 1st, 2009 at 4:07pm. The Avett Brothers are all about feeling. On Emotionalism, their last proper full length, the Avetts certainly didn’t shy away from feeling; they celebrated it. The songs from Emotionalism were mostly led by banjo, upright bass, occasional strings and the just-twangy-enough vocals of one or both brothers. Everything about that setup said these guys were playing bluegrass music, but what came out of the speakers felt different. That element, that unique style of bluegrass that sounded more like an alt-country-influenced indie band, clearly set the Avetts apart from anything I’d ever heard before. But there was more to them than that. There were also those straightforward and heartfelt lyrics, melodies that felt nostalgic and comforting, and an overall sense that these guys grew up loving American music and wanted to make it their own, to take it somewhere new while keeping everything that was great about it intact. 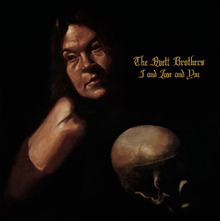 On their newest album, I and Love and You, the Avett Brothers have expanded their sound to include piano, drums, bass, and organ on most tracks. These additions have taken the feel of their music in a soulfully classic rock direction that seems to draw from the late 60’s and early 70’s when The Band, Van Morrison and Neil Young were all doing their best work. The familiarity of these lush piano ballads is balanced nicely with the more classic-sounding Avett tracks, where banjo strumming and sparse percussion take center stage with their signature straightforward lyrics and youthfully energetic vocals. Among these styles are plenty of other shades, and even a few radio-friendly songs that I’d love to see get some airplay. With the album’s availability at Starbucks, a big feature in Rolling Stone, and what I’m sure will be a majority of glowing reviews across the board, I’m looking forward to these guys finally blowing up. The idea that a sound this rootsy and authentic can go anywhere near the mainstream has me optimistic about the future of popular music in America. Without getting too mushy, I will say that this album hits all the right chords. The feel captured within has got me nostalgic for a time I never knew, but I’m happy the Avetts are bringing it back for those of us who weren’t lucky enough to be around when this type of music was first being produced. That period was a definite peak, in my opinion, and with more artists like Dr. Dog, Wilco, Jenny Lewis, M. Ward, She and Him, Fleet Foxes, My Morning Jacket, Iron and Wine, Gillian Welch keeping the spirit alive, another peak could be within sight—a musical renaissance of sorts, where modern artists take everything the traditional ones got right and make it their own. Either way, I can’t wait to see what bands like this will be doing next. And with I and Love and You, the Avett Brothers just became my favorite. Record Store Day: Is It Already That Time of Year Again?